Already, this winter seems interminably long. Everyone I know is yearning for a respite from grey skies and single digit temperatures. But an escape to the Caribbean isn’t always in the cards. The next best thing? Recreating the spirit and flavors of the islands at home. No dish is more iconic than Jamaica’s fiery, lip-tingling, explosively flavorful jerk. Like many island cuisines, jerk is wholly dependent on ingredients found right there on Jamaica—primarily, sadistic little chiles called Scotch bonnets, bay leaves, allspice, scallions, thyme, and native pimento wood. Versions of jerk have been around since the mid-1600s when African slaves escaped their Spanish captors after the British invaded Jamaica. Called the Maroons, these fierce and resourceful survivors adapted cooking methods from their homeland, digging pits, constructing fragrant grates out of green pimento or sweet wood (bay), and roasting wild pigs. (Yes, pork—not chicken—was the original jerk.) The environment was both spicy and steamy, but corralled the fragrant smoke that could have given away their positions. The word “jerk” may come from the Carib/Arawak Indian word charqui, which eventually evolved into jerky, and then jerk. A skilled practitioner is called a jerk master. If you’ve eaten authentic jerk, you know there’s an elusive flavor that can be difficult to recreate at home. The secret is pimento wood. A little over ten years ago, Minneapolis-based Gary Feblowitz was on a Jamaican vacation when a diving injury extended his stay by almost two weeks. Today, he is the only U.S. importer (his website is called PimentoWood.com) approved by Jamaican authorities to bring this unique wood to the country. Recently, he began selling a line of jerk products—pimento sticks, chips, chunks, pellets, planks, sweet wood, and pre-made rubs and marinades—on Amazon.com, making it easier than ever to throw a Jamaican-themed barbecue bash. Scotch bonnet chiles can also be difficult to find in the U.S. Feel free, however, to substitute habaneros or even serranos, though the flavors will be less fruity. As for the reason behind the shortage, I was told squatty Scotch bonnets were being used to smuggle drugs into the country and are now banned. I couldn’t verify this, and in any case, they are now being cultivated in California. 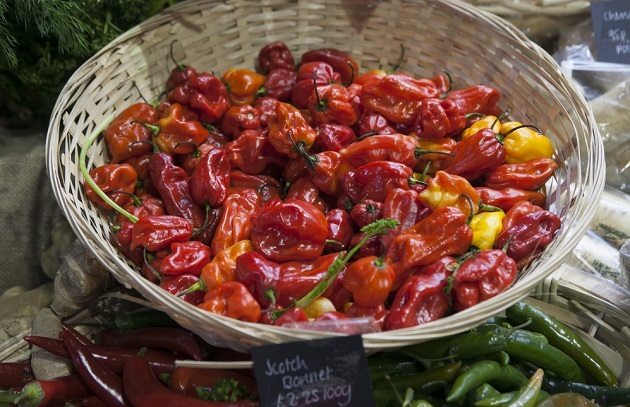 Scotch bonnets are extremely hot, so be sure to wear latex gloves or thoroughly wash your hands after handling. Steven’s recipe for jerk pork, which originally appeared in Planet Barbecue, is one of my favorites. He maximizes the surface area by scoring the pork, allowing more of those aromatic flavors and spices to penetrate the meat. For the real deal, lay sticks of pimento or sweet wood directly on the grill grate; this will be a rack for your pork. (Chicken can be cooked this way, too. For a recipe, click here.) Or build a bed of bay leaves under the meat before smoking. You can also pleat a couple of sheets of heavy duty aluminum foil into a pouch. Add whole allspice berries, cinnamon sticks, and bay leaves to the pouch and close. Poke holes in the pouch, then position it on the coals or underneath the grill grate. Pimento wood is quite dense, and can be used for more than one grill session. Side dishes like rice and beans, coleslaw, and a Jamaican fry bread called festival make great accompaniments. (For a recipe for the latter, see The Barbecue! Bible.) Play Jamaican steel drum music, break out the Red Stripe beer or rummy cocktails, and enjoy an island idyll. Ya, mon! Tell us how it goes on Facebook, Instagram, Twitter, or the Barbecue Board.